Meet Mike, my military friend. We met in Gainesville (circa 2007) when we had Portuguese class together during my stint at UF. He has since graduated and is serving aboard a Naval vessel based in San Diego. His ship is out cruising right now somewhere in the Indian Ocean. He can’t access most internet sites and doesn’t get snail mail very often, so we’ve been emailing every couple of days. I also send him my blog updates for news and humor. 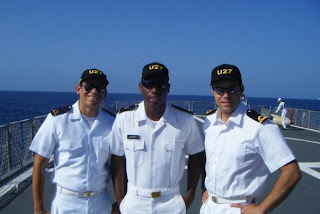 Mike with friends last summer, aboard a Brazilian ship. He’s been answering my questions about life on board from the start, and I thought they’d make interesting reading for a broader audience. I’ve decided to post once in a while with my questions and his answers. These are a mix from our first few emails. Enjoy! What kind of boat/ship/submersible are you on? Does it have a name? 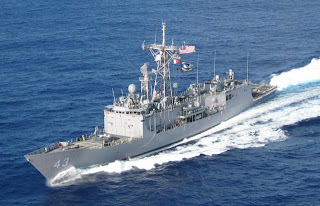 My ship is the USS X [not its real name obviously, but he asked me not to mention it for security purposes], stationed in San Diego. It’s a frigate. Frigates are kind of like the Geo Metros of ships. Old, slow, they don’t do much, and they have old equipment, they get laughed at. We don’t even have missiles, except on our two helicopters. But for me the most important thing was to have a small crew. Our crew is just over 200, as opposed to destroyers and cruisers, with crews around 400. Did I mention they are falling apart? Frigates were built during the Cold War to be cheap, versatile ships that could hunt Russian subs. They were only intended to last 10 years. My ship was built in 1984. It is the year 2009. It should still be in service until the year 2015. Do the math. Everything is old, and everything constantly breaks. But I knew what I was getting into, and I don’t at all regret my decision to be on this ship. What is good about a small crew? You said the bigger boats have 400...what's great about 200 instead? What do your duties look like? I have two main responsibilities. First is standing watch. Somebody’s gotta be awake to watch the ship, right? We have five watches 0200-0700, 0700-1200,1200-1700,-1700-2200, and 2200-0200. We have four watches, so that means we go backwards through the order. Earlier today I had 0200-0700 (or the Reveille Watch), tonight I’ll have the Mid Watch (2200-0200). Right now I’m standing watch on the bridge, which means I help drive the ship. Later I’ll rotate down to Combat, where I’ll help key an eye on other possibly hostile surface, subsurface, and air contacts. My other responsibility is being a Division Officer (DIVO). I’m the Assistant Auxilaries Officer (AAUXO). It’s kind of a made up job. There are so many Ensigns (my rank) that they had to make up things for us to do. In my case, they just gave one Division and extra DIVO. The actual AUXO has been in the Navy for two years, so he actually understands more of what’s going on and handles most of the Divisional Work, like paperwork and makin sure parts get ordered. Little by little I’m learning what I have to do for this part of my job. We are going to the Persian Gulf as I said earlier. I don’t think I can tell you exactly what we are doing, though I do know. But I’m not quite sure where in the region we will be going, although I do know that we are scheduled to make a couple port calls in Bahrain. The best part of the job so far is going outside in the middle of the night, breathing the fresh, unpolluted air, and being able to see thousands and thousands of stars. p.s. you need a better caption for the picture--is Mike the one in the middle? i need help! yep, he's the one in the middle. caption = fixed. ooh, interesting. i've heard of frigates, but never really knew what they were.